My name is Roozbeh Mirebrahimi. I was born in Rasht, Iran, on September 1978. I am a journalist and am at present the chief editor of the Persian language periodical Iran in the World. I have lived in the United States since 2006. I was the second child of a lower middle class family in the Caspian Sea area, lower class by Western standards. My father was an illiterate commuting bus driver, but my mother had a high school diploma. Our limited income was not enough for a family of five, so my mother, who knew a little sewing, has to use her craft to support the family. I started my career as a journalist at a very young age, having developed a passion for reading. My father was a soccer fan and liked to follow the sport news. Not knowing how to read, he would buy me the sports magazines for me to read to him. Exposed to sports news, not only did I become a sports fan too, but also I become an ardent reader. Very soon, my reading basket was piled high with all sorts of newspapers and magazines, political and social as well as sports. With reading newspapers, a new idea formed in my mind. I dreamed of becoming a journalist. I dreamed of seeing my own writing in newspapers on newsstands. To fulfill that dream, I bought a typewriter and started to publish my own newspaper, a publication that has only one writer and one reader—myself! I was so passionately determined to become a journalist that I did not stop sending letters to publications or walking into their offices and dropping off my writings. It did not take long for all my dreams come true. An open atmosphere for publications and press, which was ushered in by the new cabinet of President Mohammad Khatami in 1997 created a good opportunity for people like me to enter the journalistic arena, where I found a place for myself too. At first, I wrote for various publications free of charge, being more interested in getting my work published than making money. But I soon received offers to be paid for my writings and became a professional journalist. I worked very diligently and learned reporting and writing from my colleagues and my editors. I was only twenty-four when I was appointed to the board of editors of the political desk in the Etemad, a national daily. Prior to that, I had also been in charge of the newsroom of a few other newspapers. 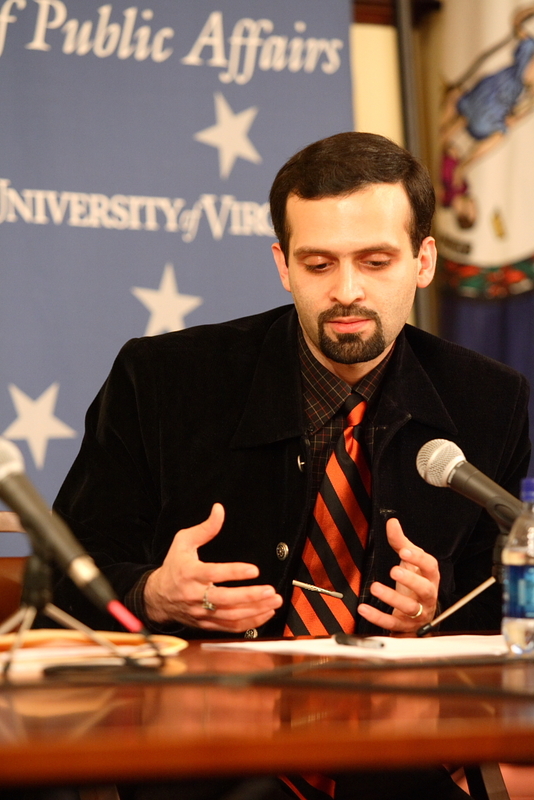 Since I had been interested in politics since my youth, and had read so much in this field, I focused on it as my journalistic career, and worked for years as a political columnist, analyst, and essayist in Persian publications such as Etemad, Hambastegi, Tosseae, Mardom Salari, Sedaye Edalat, Mellat, Jomhuriyat, Etemad Melli, Sharq, and, magazines such as Jameye Madani, Sepideh, Tabarestan-e Sabz, and Eqtesad-e Khanevadeh. During my activity as a journalist in Iran I have been under every kind of pressure from the security and information bureau. Limitations have been imposed on publishing my writings, which suffered various forms of censorship. However under all circumstances, I have persevered in using every opportunity, no matter how small, to express my views and publish them. In fall 2004, I was arrested, along with three other journalists, by the security forces for being an Internet activist/user. We were the first group of Iranian journalists to use the Internet and blogging to report news and analysis. This was referred to later as “The Blogger Case”. They leveled such heavy charges against us that we thought we were likely to face a long term prison sentence and that our dreams were ruined. I was placed under severe physical and mental pressure in prison. After two months in solitary confinement, I was so isolated that I broke and agreed to write the confession the security forces wanted me to do, apologizing and repenting for my deeds. I was then a newlywed then and in fact I passed my honeymoon in prison by myself. For my temporary release from prison, I had to declare my “repentance” and publish it in newspaper. My other three friends were kept in prison as hostages until I wrote and published this letter. I did as I had promised. They were then released one by one. They wrote their own letters of repentance as well. They also took a clip of film of us in prison and also brought us to TV to broadcast our confession. Everything took place under great pressure, including threats to our families and us. After leaving prison having paid on heavy bails, two of us decided to reveal what we had suffered. We secretly visited the Truth-finding Commission formed by President Khatami. But later on, the head of judiciary was assigned to pursue our case. He, in turn, assigned a team to investigate and examine our case. All this took place while we were under careful scrutiny by the security forces so we had to visit them secretly as well. Once, when we visited Ayatollah Shahroudi, chief of judiciary, the security forces sent us a message that you all could get killed in a car or street accident just like so many others who die every day by accident! These are just some small horror stories of those horrifying days. After my release, I stayed in Iran for two more years waiting to be called back to finish my term. During those years, I tried to continue my work as a journalist, but the security forces did not let me. They would follow me everywhere and pressure my employer to fire me. Wherever I found some job, I would be fire a little after. No one wanted to give me a job, and without a job and without money, life was very difficult. In the summer 2006 I decided to go to France for a while. A little later, with an invitation from Princeton University for a talk, I came to the United States and stayed here since. First I worked as a researcher for a few reports from Human Rights Watch. I also worked as a “The First International at Residence” in CUNY Graduate School of Journalist. And for two more years, I was a visiting scholar in New York University. I also worked as a reporter for Radio Farda in New York all the while continuing to write for Persian websites and newspapers. I fulfilled my dream of dreams of becoming a journalist and moving up from a simple reporter to editor in chief. I was appointed at age of 24 to be editor in chief of the political section of a national newspaper. I was the youngest journalist to have ever held that position in Iran. My first book was ready to publish when I was only 25. Last but not least, during my professional career, even during the hard period in prison, I had the courage to stand up for the truth and my beliefs. I never wavered, even when I was threatened with death. The marginal stories and events that happened during those days could make a book. Story of a part of my life that could show Iran’s new generation challenges and dreams and failed. Story of hope and hopeless. I am an Indian journalist working as “Executive Producer” in a 24-hour English channel called “NewsX”. Currently, I am the “Assignment Head” of the channel. My primary job is to keep a steady news flow round the clock. As my channel has an international focus, we do need phone-interviews, interviews from foreign journalists/experts. Hence, my channel would love to be in touch with you. I would appreciate if you incorporate my contact details in your mailing list for further communication. It would be nice if I get yours too, especially your CELL NO AND SKYPE ID, if any. My cell no is : + 91 9810952297. Looking forward to hear from you on more about your work. man ye maghale dar newyorker dar saal 1977-79 khondam ke dar morede ardeshir zahedi bood, lotfan agar ino peyda kardin bara man befreseen. dar morede party haye ardeshir zahedi bood.